That summer, Enzo turns ten. His hips had healed poorly after being hit by the car, but vowing to not cost Denny any more money, he ignored the pain as much as he could. Denny had been taking some instructing gigs at Don Kitch's driving school, and often took Enzo with him. Enzo tells the reader he very much enjoyed being a track dog. The narrative that Enzo is telling us is beginning to catch up with the opening scene of the novel. Enzo is old, he's in pain, and he's doing his best to not make a big deal out of it. Presumably, he also still hasn't accomplished what his soul is supposed to. One day near the end of July, while Denny is out on the track with a student, a red Ferrari pulls up to the school. Don calls the students in for lunch and then calls Denny over, reintroducing him to Luca Pantoni, the man from Ferrari. Don asks Denny if he'd show Luca the track. He agrees, and Luca asks Denny to drive. They head off onto the track and Don, Enzo, and the students head to the bleachers to watch. Don cryptically says that Denny has an audition. As the students watch, Denny takes a few slow laps, and then all of a sudden the car turns from a car into a blur. The students are stunned. The reader already knows how much Enzo admires the Ferrari brand and the way they do business (remember his discussion of Luigi Chinetti), so Denny having an "audition" with an important Ferrari man, while certainly an achievement in its own right, takes on deeper significance. The language used to describe the experience of watching Denny drive underscores how good of a racer Denny really is. Denny and Luca, after a cool-down lap, return to the paddock and the students fawn over the car. Don herds the students into the classroom, and Luca offers Denny a business card. He tells Denny he'd like Denny to work for him in Italy, teaching but mostly testing vehicles. Denny would be provided with an apartment for himself and Zoë. Denny, stunned, asks why, and Luca replies that he hears Denny is an exceptional driver in the rain, and offers to explain further when Denny can join him for dinner at his house in Italy. Denny tells Luca that he must decline, to which Luca says that he knows what Denny is going through and will keep the position open for when things are resolved. This story seems too good to be true, and Luca's statement that he's offering Denny this job because of his skill driving in the rain provides a very Enzo-esque sense of drama to the situation. While Enzo was there and watching, keep in mind that parts of the story are also admittedly fictional and fabricated for the sake of a more dramatic retelling. Thus, it's somewhat unclear if this is truly what Luca said, or if this is a fiction in which Enzo continues to draw similarities between Denny and Ayrton Senna. Luca drives away, and Don appears to ask Denny how it went. He tells Denny that Luca's been interested in him for years and respects how Denny is fighting for Zoë. Denny asks what happens if he doesn't win, and Don replies that there's no dishonor in losing, only in not racing for fear of losing. This tidbit of information about Luca's longstanding interest in Denny serves to create mystery and drama. Once again, a racing truth is applied to real life to underscore how integral driving is to Denny’s selfhood. Brock, Zoë. "The Art of Racing in the Rain Chapter 50." LitCharts. LitCharts LLC, 17 Feb 2017. Web. 25 Apr 2019. Brock, Zoë. "The Art of Racing in the Rain Chapter 50." LitCharts LLC, February 17, 2017. 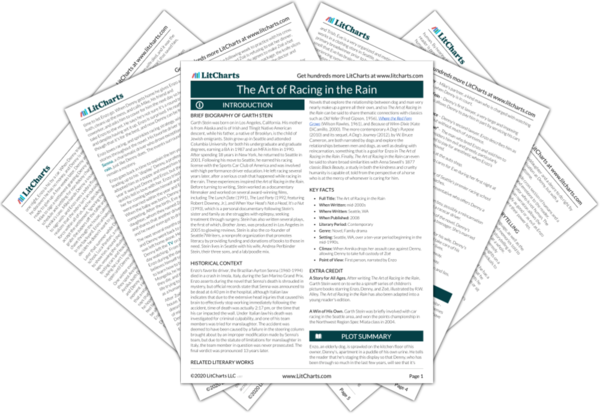 Retrieved April 25, 2019. https://www.litcharts.com/lit/the-art-of-racing-in-the-rain/chapter-50.